Impi Visser will make his Springbok Sevens debut in Dubai this weekend after he was included in the travelling squad by Blitzbok coach Neil Powell, who also recalled Kyle Brown, Branco du Preez and Muller du Plessis for the opening tournament of the 2018/19 HSBC World Rugby Sevens Series. The World Series opener will be played at The Sevens Stadium at the outskirts of Dubai on 30 November and 1 December and will see the Blitzboks defend the Emirates Trophy they won last year, as well as the overall series title. The South Africans have been grouped with Argentina, Samoa and Zimbabwe in Pool A. 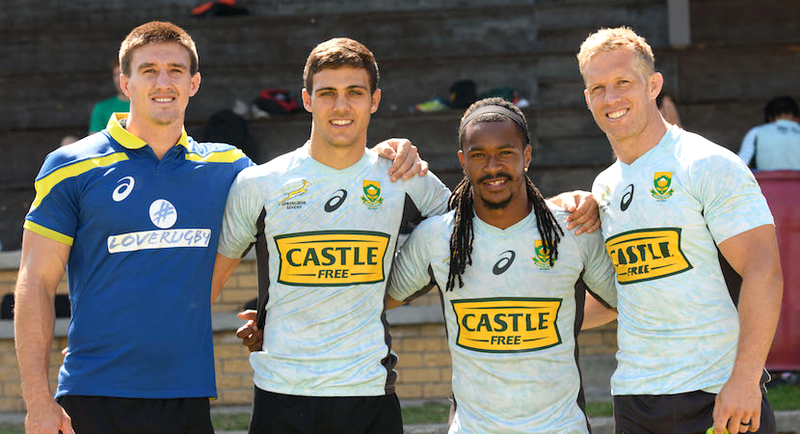 (From left to right) Impi Visser, Muller du Plessis, Branco du Preez and Kyle Brown. Credit: SA Rugby. Visser will earn his Blitzbok debut in a team laden with experienced campaigners, including Brown (65 tournaments) and Du Preez (61) tournaments, both of whom are fit again after missing out on the Rugby World Cup Sevens in July, where South Africa claimed bronze. Du Plessis also missed out on the San Francisco trip and returns to the squad after he last played for the Blitzboks in Singapore in April. Philip Snyman will captain the side for his third season in charge, while regulars Zain Davids, Ryan Oosthuizen, Werner Kok, Justin Geduld, Dewald Human and Siviwe Soyizwapi will make the trip to Dubai. Selvyn Davids will travel with the side as the official replacement player. Stedman Gans, Cecil Afrika and Heino Bezuidenhout were not considered due to injury. “I am pleased with the final selection, although it was not an easy one for me,” said Powell. “A number of the guys outside of the squad were unlucky not to make the side, but it is good to have that depth. We have a solid core of experienced players and I am expecting them to show that in Dubai, a really tough tournament as you have no idea what to expect from your opponents. Visser made his SA Rugby Sevens Academy debut in Dubai in 2016 and played there again last year before suffering a serious ankle injury when he toured South America with the Academy squad last January. The former FNB Tuks player, who was part of their FNB Varsity Cup winning side in 2017, moved down to Stellenbosch this year, where he completed his degree in Mechanical Engineering. The 23-year-old Visser started his career at scrumhalf, where he played Craven Week for Mpumalanga, before moving to the midfield for the University of Pretoria. He will play in the forwards for the Blitzboks. “I am very excited about the opportunity to play for the Blitzboks,” said Visser. Kyle Brown (66th) will move one tournament closer to the all-time Blitzboks mark of 68 World Series tournaments achieved by Frankie Horne. Branco du Preez (1162) is second on the Blitzboks all-time points’ scoring list. Cecil Afrika (1430) heads that list. Snyman, Kok, Brown, Du Preez, Specman and Geduld was part of the victorious 2017 squad in Dubai.